When materials need to be loosened up or shredded, the Lyndex PC and PCZ machines offer the ideal solution. The PC machine range is ideal for reducing material to A5 size. The machine is fitted with a hydraulically adjustable anvil, which allows material to be sized. The Lyndex PC can process up to 40 Tonnes/hour. The PCZ machine range has a rotor fitted with rotating hammers which shred material down to 50 x 50mm. Lyndex conditioners of the PC range are designed to open up, loosen, and coarsely shred very dense and difficult material, such as bundles of newspapers and magazines, as well as coarsely shred cardboard boxes, corrugated cardboard etc. Even bale discs from compressed paper bales can be re-opened. 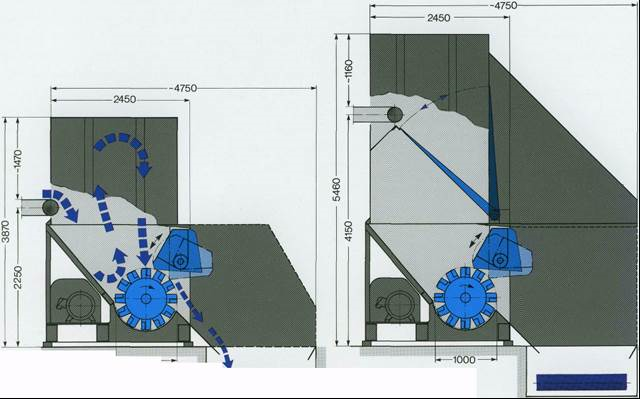 The shredding and conditioning process spreads the material evenly across the entire width of the press box, increases the filling density of bulky material as well as the output of the baler, and at the same time improves the bale density, bale shape and stability. Lyndex PCZ paper shredders are designed not only to loosen up and tear open the input materials but also to shred them. All advantages are retained, i.e. low energy costs, minimum dust emission, and minimum destruction of fibre structure. The material is only shredded to the extent to achieve bales of stable shape and high density. As with the PC paper conditioner, the PCZ increases the infeed density and thus the press output when used on bulky, voluminous material.